When you download the theme from Themeforest, you will get an archive file in .zip extension. When done, you should see theme_name.zip. Please, follow the steps below to install your Billio Theme. Step 2 – Go to Appearance > Themes. Click Add New button,located at the top of the screen. Step 3 – Continue by clicking Upload Theme . Step 4 – Choose billio.zip. 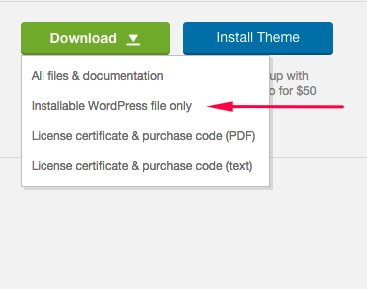 Step 5 – Wait while the theme is uploaded and installed. Step 7 – Tick checkbox right beside Plugin label to tick all of plugins. Step 10 – Tick checkbox right beside Plugin label to tick all of plugins.